By Bob Sperber, for Pharmaceutical Commerce. On its own, the animal-health business, growing at roughly 5% annually for the past several years, would not be considered a hot investment opportunity. But by comparison with the human-health pharma business—which actually went negative in the US in 2012, according IMS Health—5% growth in a stable, essential business is attractive. 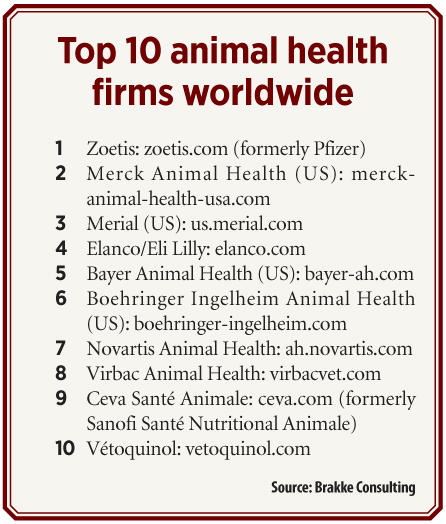 Thus, when Pfizer spun out part of its animal health business, now branded as Zoetis, raising $2.2 billion for 20% public ownership (Pfizer retains the rest), Wall Street voiced its approval. Zoetis’ stock continued to rise through early March, and Zoetis is now “the largest standalone company fully devoted to animal health medicines and vaccines,” as Pfizer CEO Ian Read noted. Other ownership reshufflings have proceeded apace. Bayer put down $145 million ($60 million up front) for Teva Animal Health in January, thereby getting a stronger presence in generics for both the pet (companion) and livestock (production) animal markets. This deal follows Bayer’s 2012 acquisition of KMG Chemicals’ animal health business. Also in January, Neogen (Lansing, MI) announced the purchase of genotyping pioneer Scidera Genomics (formerly MetaMorphix/MMI Genomics), for an undisclosed sum. Neogen, itself a leader in diagnostic products, pharmaceuticals, veterinary instruments and vaccines, also acquired animal health firm, Macleod Pharmaceuticals (Fort Collins, CO) last October. One animal-health player that won’t be making any divestiture moves is Eli Lilly, with its Elanco division, which saw 18% growth for the quarter and has been a profitable unit in the face of human-pharma generic competition: “We have no intentions of divesting that business through a sale or public offering,” Derica Rice, Lilly CFO, told Wall Street analysts recently, adding that plans call for doubling company revenue in coming years. With revenues from the top 20 manufacturers generating by some accounts about 85% industry sales, and generics flattening revenues for once-protected proprietary blockbusters, the current business environment is stable but slow-moving. Worldwide animal health sales grew roughly 5% in 2012 to top $22.5 billion (excluding nutritional feed additives). North America led with a 38% share, followed by Europe (34%) and Latin America (12%), according to animal-health management consultant Ron Brakke, of Brakke Consulting, Inc. (Dallas). “For the past five to seven years, almost all the growth in the US market has been in companion animals,” Brakke says, noting small single-digit gains in the pet sector over this period. 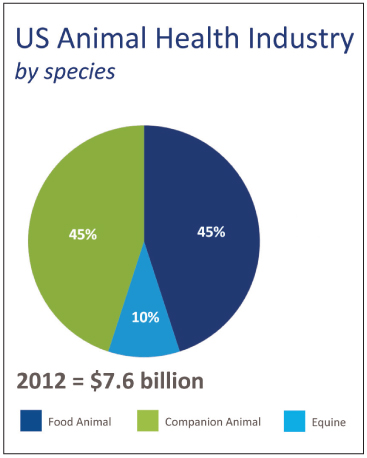 Today, the US pet and production animal health sectors are tied with a 45% share of market sales, with equine sales accounting for the remaining 10%. The same is likely true of the worldwide market, where the pet/production market share split is 43%–57%, but includes equine business in the latter. 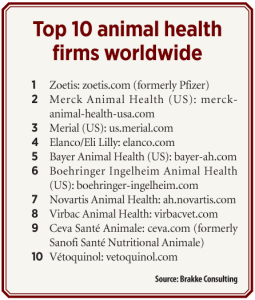 Generally speaking, the production-animal-health market, at least in the developed world, cycles up and down based on food-industry trends and animal growing conditions. Companion-animal markets have been rising steadily for years. In keeping with the creeping gains on the companion side of the market, Americans spent an estimated $12.6 billion on pet supplies and OTC medicines combined, up 6.7% from 2011, per the American Pet Products Assn. (Greenwich, CT; www.americanpetproducts.org). APPA’s growth numbers for veterinary care products including prescription drugs, have remained flat in recent years; growth was 2.9% in 2011 and 1.3% in 2012, ending 2012 with revenues of $13.6 billion. Among the factors contributing to the malaise, live-animal sales went flat in the recession and remain so. On the upside, food sales and pet supplies are both “trending up nicely,” and supplements and alternative health products and services “are going through the roof,” says APPA president Bob Vetere. 2012 was mixed for the US livestock market. Dairy cow and pig inventories rise and fall somewhat erratically. Bovine numbers continue a years-long decline. However the “other white meats” are up with swine numbers on the rise, and poultry broilers continuing a decades-long upswing. A hopeful Brakke believes 2013 “should be an excellent year” if drought ends and grain prices fall in livestock producers’ favor. Parasiticides, antimicrobials and vaccines are among the top-selling animal health product categories for both companion and production sectors, with the pet space driving analgesic sales and livestock needs driving production enhancing products. Online retailers, big box retailers and a sluggish economy also hurt revenues for vets and their suppliers. Additionally, traditional mom-and-pop practitioners are facing tough competition with large veterinary chains such as Banfield Pet Hospital with more than 800 locations, and VCA Animal Hospitals with more than 540 locations. Much as Home Depot and Lowe’s put local hardware stores out of business, the rise of these chains “changed the ballgame significantly with their economies of scale,” says Jennifer Landini, practice manager for Heal Veterinary Clinic (Chicago). As vets face stiff competition from each other, they also face the challenge of a sustained decline in pet owner visits through the latter half of the 2000s. The latest (2011) research finding by Bayer’s Animal Health Division found that 56% of pet owners believe that their vets don’t clearly explain when they should bring their pets in for procedures or tests. Another threat comes from market dynamics that directly affect manufacturers and their own marketing efforts. Flea and tick treatments are the prime example, led by products including Bayer’s Advantage and K9 Advantix that remain in heated competition with Frontline and a plethora of additional generic-based competitors. Where there are heated market battles, there are also legal battles and their consequences. For example, a 2011 recall and production stoppage by Sergeant’s Pet Care Products led to shortages of Frontline Plus-type fipronil-methoprene products in the marketplace. (Fipronil kills adult pests; methoprene kills eggs and larva.) Complicated patent infringement litigation ensued between Sergeant’s and Sanofi’s Merial, the latter marketing Frontline Plus through contract manufacturers including Velcera, whose subsidiary FidoPharm produces PetArmor Plus. Sergeant’s won in its efforts, but by October 2012, OTC drug-maker Perrigo Co. (Allegan, MI; www.perrigo.com), acquired the company for $285 million. Within four months, Perrigo also announced an agreement to acquire Velcera for $160 million cash. Joining the fight over intellectual property and generics, product diversion is also hotly debated as flea and tick treatments and other hot-selling pet products intended only for sale to veterinarians often find their way to unauthorized online retailers. When FDA actions caused Novartis to suspend production in December, 2011 at a key OTC facility in Lincoln, NE, it caused nationwide stock-outs for leading animal health brands including Interceptor (milbemycin oxime), Sentinel (milbemycin oxime/lufenuron) and Deramaxx (deracoxib). Despite months of lost production, products seemed nonetheless abundant for Sentinel, Interceptor and perhaps other drugs through non-authorized retailers including Doctors Foster & Smith. Novartis insisted it did not sell these products to the unauthorized outlets, which would be in violation of its policy to sell them only through the “ethical veterinary channel.” This channel refers to barring sales of specified nonprescription—OTC—drugs to sources other than veterinarians. Similarly, a Merial customer support representative told Pharmaceutical Commerce that while the company won’t knowingly sell Frontline products to the likes of Walmart and Target online or otherwise, “I’ve seen invoices for Frontline products from those retailers,” despite Merial’s policy to the contrary. 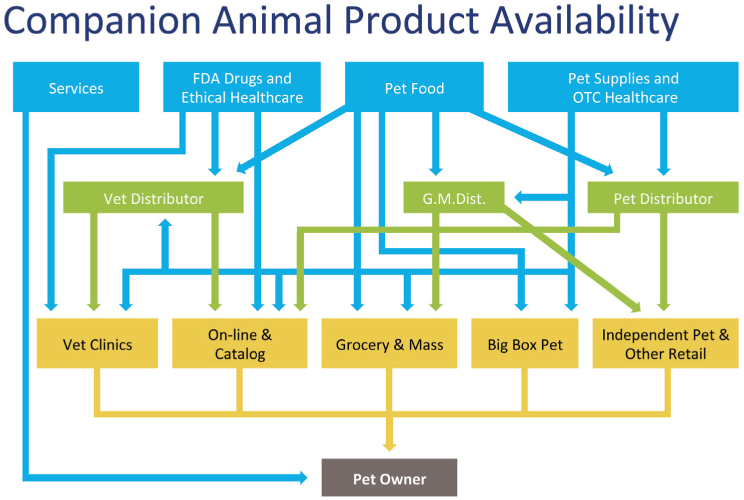 So where do these retailers get non-authorized products—gray-market product diversions involving veterinarians supplying aggressive brokers or distributors? Manufacturer or distributor personnel who are ignorant of, or in violation of guidelines? The answer is unclear. In any case, it would seem that “ethical” agreements could become vestigial reminders of a time before the explosion of retail supply channels. For these OTC drugs, the main ethical breech is contractual, since it is not in violation of legal standards for a broader swath of retailers to sell OTC drugs. A somewhat related issue regarding prescription pet meds is that of prescription portability, which if legislated would require veterinarians to provide prescriptions as well as written disclosure to let pet owners know that the prescription can be filled anywhere, not just the vet’s dispensary. Congress has considered H.R. 1406, the Fairness to Pet Owners Act introduced in April of 2011, and the FTC held a public workshop to address the issue, but neither seems to be producing any imminent action. Manufacturers would seem to be on the sidelines in the portability fight, evidenced by a lack of advocacy on the issue. APPA has been neutral because its manufacturer members “haven’t expressed a cohesive message,” Vetere says. The American Veterinary Medical Assn. (Schaumburg, IL; www.avma.org) “actively opposes” any federal portability law, which would be ”unnecessary and redundant,” says Dr. Lynne White-Shim, assistant director for the AVMA’s scientific affairs division. “I have no knowledge of this being a problem,” she adds, indicating that veterinarians already practice portability as a de facto standard in keeping with AVMA’s longstanding guidelines. In addition to treatments, animal health distributors also offer diagnostics, including reference labs, instruments, consumables and test kits. This category grew 6% last year to top $1.8 billion, up more than 250% since 2005. That 6% was driven by Idexx Laboratories (Westbrook, ME), the largest player by orders of magnitude with 2012 revenues of $1.3 billion, offering Wall Street guidance of 8.5% or more growth for 2013. Brakke says diagnostic areas to watch include investments in IT (from communications to mobile) as well as supply chain alliances with distributors such as MWI (Boise, ID), with 2012 revenues of $2.1 billion, up 32.6% from 2011, partly owing to the pursuit of formal, sometimes exclusive, partnerships with diagnostic suppliers as well as drug-makers. To avoid product diversions, at least coming form the source, manufacturers police their ethical veterinary channels by integrating their ERP-level customer lists and requirements with distributors using do-not-sell lists. These designate which SKUs can be sold to which customers. Such considerations as well as electronic ordering, inventory and logistics management, and lot/batch tracking follow standards such as XML schemas and EDI standards managed and updated by the ANSI/ASC X12 committee (www.x12.org). Beyond unit-level serialization coming to human pharma, more drugs in the animal health supply chain will see serial numbers at the vial and retail-pack level. While serialization isn’t on the regulatory radar screen for animal health, neither will it be a technical hurdle if that day comes. “There are no substantial differences between supply chain processes for animal health and human health,” says Steve Epner, founder of Brown Smith Wallace Consulting (St. Louis; www.bswllc.com), which researches and offers software selection consulting to distributors. To that end, distributors are offering online ordering systems, regulatory compliance and other services. Leaders have implemented electronic ordering and inventory control systems. Animal Health International (Greeley, CO; www.animalhealthinternational.com), sells automated micro-ingredient machines for livestock feed additives to its production-animal customers. 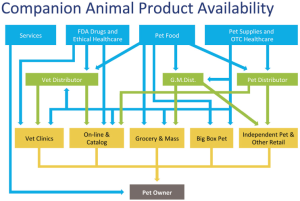 A broader industry response is underway to create an industry standard repository for all pet industry product data uploaded by manufacturers and shared across 6,000-plus pet industry retailers and distributors. Put forth by the Pet Industry Distributors Association (www.pida.org), this Pet Industry Database (PIDB) venture would replace the need for manufacturers to transmit data to each individual customer with a single upload to the system, which would integrate ERP, inventory and promotional systems from factory to store shelf. PIDA says the database so far includes 190,000 products, and will lead to higher fill rates, reduced ordering errors, greater customer satisfaction, increased sales “and a much more effective way for consumers to find and consider your products online,” according to a joint letter from Steve King, PIDA president and APPA’s Vetere. R&D has dipped and remained flat perhaps due to consolidation: “It can be a challenge for companies dealing with consolidation to stay focused on the marketplace as they work to get their organizational ducks in a row,” Pohlman says. “It’s not necessarily a bad thing, though,” he adds. His own employer, Lextron Animal Health, acquired and took the name of Animal Health International last year, which he says has been “a good thing” for the greater resources it brought. Between the last two industry surveys in 2008 and 2011 by market research firm Packaged Facts (New Orleans, LA; www.packagedfacts.com), results showed a paucity of exciting announcements “beyond a couple of new cancer drugs,” says David Lummis, senior pet market analyst. “I haven’t seen a lot of horn blowing about new drugs in the pet space, including the area of lifestyle drugs pharmaceutical manufacturers pinned their hopes on a few years back.” Big brands in recent years failed to capitalize on consumers’ bond with their dogs with products like Pfizer’s Slentrol (weight management) and Cerenia (motion sickness), and Eli Lilly’s Reconcile (fluoxetine/Prozac) for separation anxiety. Research shows no concrete reason for the failures, but experts don’t deny that despite the brands’ considerable online promotions and consumer education campaigns—including videos moderated by veterinarians—the decline in vet visits and the proliferation of market channels may be factors in a disconnect between pharma brands and consumers. If so, the solutions may come with both tighter partnerships between supply chain partners as well as a more holistic go-to-market strategy. Leveraging human drugs for the animal market remains a mainstay of opportunity and the “greatest pipeline for innovation,” according to Stephen Rothenberg, consultant with Numerof & Associates, (St. Louis; www.nai-consulting.com). He reasons that while animal health is a much smaller market, “most R&D has already been done,” he says. “So if your market size is a couple hundred million and you’ve spent $20 million to develop a product, it can go a long way. From an investment standpoint, it’s still a profitable route for pharma companies seeking new product opportunities.” This is especially true in light of Brakke’s estimate that FDA approval for a food animal pharmaceutical can take 10 to 12 years and cost $100 million vs. the typical companion animal drug’s under-six years and $6 million. This entry was posted in Healthcare, How stuff's marketed. Bookmark the permalink. ← Store brands: Threat or opportunity?